Small painted blue watering can made of steel, suitable to water indoor bonsai and cultivation bowls. Universal Spray Bottle Attachment for beverage bottles. Suitable for almost all beverage bottles commercially available (e.g. 0,5 l - 0,7 l - 1,0 l - 1,5 l). Makes a fine water fog by pressing and lifting the piston. Steplessly adjustable spray jet. Can also be used in oblique position or upside down! Universal Spray Bottle Attachment for beverage bottles. Suitable for almost all beverage bottles commercially available (e.g. 0,5 l - 0,7 l - 1,0 l - 1,5 l). Makes a particularly fine water fog. Steplessly adjustable spray jet. 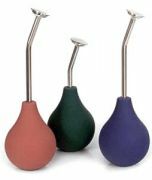 Ideal to water plants, seeds and to moisten bare roots while repotting. 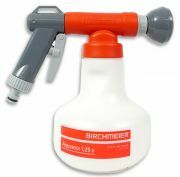 Ideal to spray plants, seeds and to moisten bare roots while repotting. Ball sprinkler to water plants. Ideal for watering your indoor bonsai. The required amount of water can be easily regulated without flowing over the pot border. With this sprinkler trees may also be sprayed. Inexpensive plastic can for watering your bonsai. The 2 grips enable an easy handling. The removable watering rose produces a fine water jet. Haws watering can with 1 rose and 1 down spout. Material: high quality recycled plastic. Suitable for Haws can, Art.no. 2326. Fertilizer mixer for private use. The spare sieve is suitable for our watering cans. It prevents the ingress of dirt and foliage when dipping it into a rain water barrel or similar in order to fill it. Without sieve all these suspended particles in the water would clog the holes of the watering rose within a very short time. Please choose product...[2332Me] Spare sieve - Brass 4 Liter (2300) - 22,- EUR - SOLD OUT ! [2332Ku] Spare sieve - Copper 4 Liter (2306/2308) - 22,- EUR - SOLD OUT ! Spare sieve - Coppercan 1,8 Liter (2307) - 22,- EUR - SOLD OUT ! [2332Ed] Spare sieve - Stainless steel 4 Liter (2303) - 22,- EUR - SOLD OUT ! Spare spout in copper suitable for watering cans no. 2300, 2302, 2302a, 2303, 2304, 2307, 2308 and 2308a. High pressure cleaner for daily use. Very high pressure, continuously adjustable jet between direct point and fan-shaped beam. 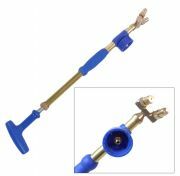 Spare Nozzle for Mini High Pressure Cleaner (art.No. 2419). The set contains fuses and safety springs as shown in the picture for multiple exchanges. With Iriso your plants will receive a measured quantity of water over a long period of time. Simply place it into the soil in order to let the hose flow easily around corners. Made in Japan. High quality made in Japan, compatible with standard connections (eg. Gardena). 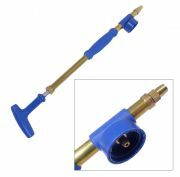 High quality nozzle made in Japan, compatible with standard connections (eg. Gardena). Compact, light (160 g), shock-resistant and easy to clean. 5 types of jet. The 0.2 mm small holes of the shower head produce a gentle jet. 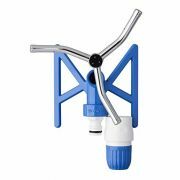 The small shower head is suitable for a well-directed and selective watering. 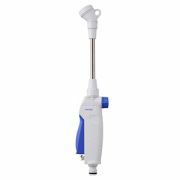 Adjustable jet: direct, mist and 2 watering variations. The grip si lockable and can be easily unlocked with one button. The connector is to be directly attached to the hose. Watering devices can be connected to the standard connection. Water flow stops automatically by removal of the device – this allows a change of connectors without having to use the faucet! To connect and prevent the twisting of your hose. If required, the joint can be turned through 360 degrees allowing thus to avoid corners and obstacles. 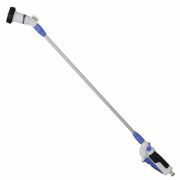 This lightweight hose reel (15 m + 1.5 m connecting hose) has an integrated 'compact shower' and an extendable foot with hole for wall mounting. Also tube with an inner diameter of about 7.5 mm and faucet connections (1/2 'and 3/4') are also included. 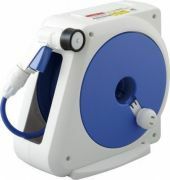 This lightweight hose reel (10 m + 1.5 m connecting hose) has an integrated 'compact shower'. 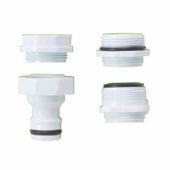 Adapter to connect hoses to indoor water taps, compatible with Takagi and Gardena connections. 2-Way Water Distributor with individual adjustable outlets supply. Suitable for tap connections and hose connections. Comfortable one-handed operation. 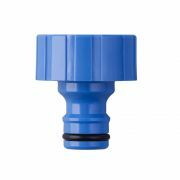 Tap piece (G3/4"), compatible with well-known manufacturers. Only suitable for model G571EX (art.no 2484). Only suitable for model GNW301NEX (art.no 2485). Only suitable for model GNZ103N11EX (art.no 2486).